Discussion in 'Video Game and Fantasy Football Board' started by BP, Mar 20, 2018. Atari is making a bold return, after unveiling the Atari VCS console. The company was once the golden boy of the video game industry, delivering at-home gaming excitement that was at the time unparalleled. Of course, the video game crash of 1983 put major dents in Atari’s standing in the industry (in part thanks to the release of poor quality tie-in games such as E.T. ), leading to the dominance of competitors like Nintendo and the gradual decline of Atari as a whole. At one point, Atari seemed dead in the water, with the rights to the brand shifting from company to company over the years with little by way of output and no new consoles since the Atari Jaguar in 1993. However, 2017 saw the announcement of a brand new Atari console, dubbed the Ataribox, and it looked as though the company would once again have some kind of presence in the industry – although Atari itself remained relatively quiet on what gamers could expect from the platform. Now, Atari has revealed a greater look at its new device, along with a confirmation of a name change. 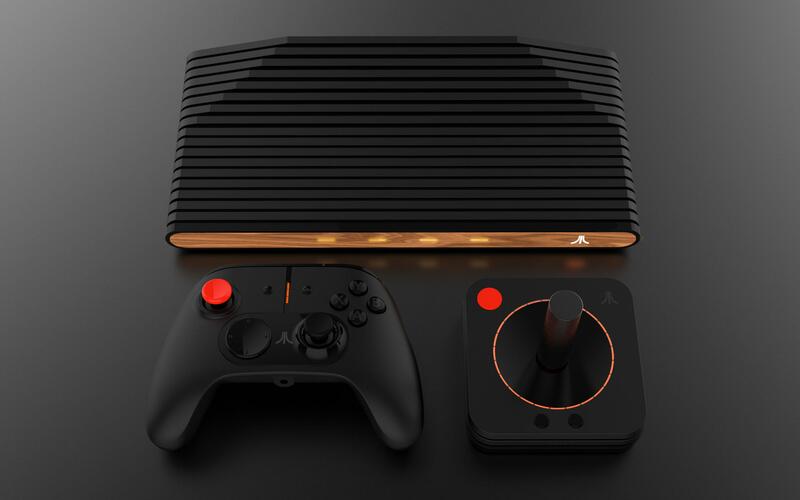 The company’s new console is now called the Atari VCS, and will be properly shown to the public very soon, with Atari able to give a glimpse at the platform at the Game Developers Conference in San Francisco on the 21 and 22 March. This will include the console itself alongside its classic Atari joystick and a more modern controller variant. “Every person at Atari and every partner involved with the new platform is just as fanatical about the brand and its heritage as our biggest fans are,” stated COO of Connected Devices Michael Arzt, and this reflection on the history of Atari is something that’s very apparent with the Atari VCS, going all the way to its wood finish design. The console itself will apparently contain both retro games and new releases, all built around an open Linux OS, although what kind of games will be available on the device specifically remains to be seen. Gamers in general will be interested to see exactly what kind of line-up the Atari VCS will have. Over the years, there have been plenty of chances to pick up third party Atari library consoles, so Atari may not be able to simply release something similar to the Super Nintendo Classic without raising a few skeptical eyebrows. Meanwhile, some video game fans might find the details surrounding the console a little too close to the failed Ouya console for comfort. Nonetheless, it will be interesting to see what Atari can pull out of the bag with this device. If the current Atari setup can rekindle some of the magic of the original company in its heyday, then there may well be plenty of takers for the Atari VCS; after all, this is the company that helped create such important aspects of gaming as the concept of the Easter egg. However, plenty of gamers may well be waiting for a few more details before committing living room space to a new Atari console. Just went live today and already has 1.6 million raised. The site may still be crashed.